The John B. Oakes Award for Distinguished Environmental Journalism recognizes journalists whose work meets the highest standards of journalistic excellence. It is presented in the fall at Columbia Journalism School. The awards panel said, "Koberstein examines the federally appointed committees that oversee U.S. fisheries and finds them rife with conflicts of interest. These councils' shoddy management of marine resources, Koberstein writes, has a direct and damaging effect on the very seas they were established to protect." “The Oakes judges applaud the craft and commitment that make this work of independent, investigative journalism stand out in a field of outstanding contenders,” said Joan Konner, chair of the Oakes Award Committee of Judges and professor and dean emerita of the Columbia Graduate School of Journalism. Runners-up for the 2004 Oakes Award included the Fort Worth Star-Telegram, the Los Angeles Times, New York Times Magazine and the South Florida Sun-Sentinel. The John B. Oakes Award for Distinguished Environmental Journalism was created and endowed in 1993 by friends and colleagues of John Oakes, former editorial page editor at The New York Times and creator of the contemporary op-ed page. 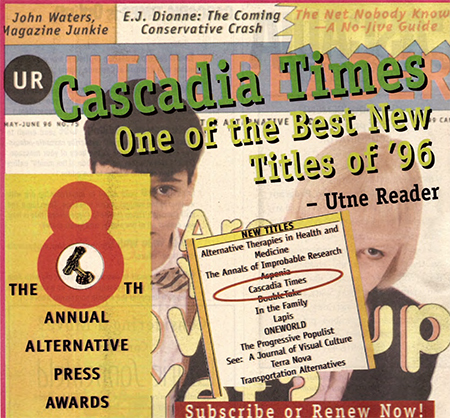 Cascadia Times has won an Utne Reader Alternative Press Award twice in its history. 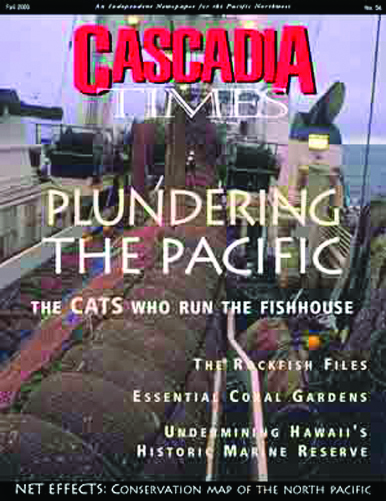 In 1996, Utne named Cascadia Times as one of its eight best new publications in the United States, and in 2005 named Cascadia Times one of the nation's eight best environmental publications.